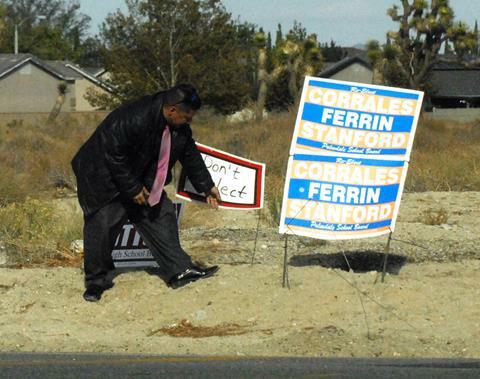 PALMDALE – Palmdale Elementary Teachers Association President Hugo Estrada was photographed this week placing a handwritten “Don’t Re-Elect” sign next to the Palmdale School District incumbent campaign signs belonging to Sandy Corrales-Eneix, Jeff Ferrin and Carol Stanford. Ferrin, who said he took the photos on Tuesday (Oct. 29), claims that Estrada placed the sign illegally. Ferrin claims he observed Estrada exit his car, place the handwritten “Don’t Re-Elect” sign at the corner of Avenue R-8 and 60th Street East (just a few blocks away from Los Amigos Dual Immersion School), and then leave the scene. He said he observed Estrada prior to school letting out at 3:25 p.m. The handwritten sign does not include a “Paid for by the committee to elect…” line, leaving no room for accountability, which is “sort of like a hit and run,” according to Palmdale School Board President Sandy Corrales-Eneix. “These types of desperate tactics, mean-spirited tactics are indicative of the type of campaign that they run,” Corrales-Eneix said Thursday. Of the 250 signs that the incumbent trio has posted, more than half of them were vandalized within days, and some were trampled, torn or taken away, according to Ferrin. Contacted by phone Thursday, Estrada said the teachers union had nothing to do with any alleged vandalism. Asked about the photos taken by Ferrin, Estrada said there was nothing illegal about his actions. Estrada said his work hours are usually from 8 a.m. until about 2:30 p.m., therefore he was not on the clock when he placed the handwritten sign on Tuesday. He said he’d placed no more than six handmade signs around town, mostly on the weekends. “I have the right as a citizen to do that,” Estrada said, adding that he requested permission from property owners if posting on private property. When he posted the handwritten “Don’t Re-Elect” sign on Tuesday, Estrada said he had not gotten permission because it was not needed. “That’s a vacant lot… I can put it there, it’s right next to their sign,” Estrada said. Read the city of Palmdale’s requirements for campaign signs here. Corrales-Eneix and Ferrin also claim they’ve received complaints regarding teachers campaigning for the PETA union slate of candidates at various school sites. There are several pending complaints and some of the most egregious have seen teachers electioneering in the classrooms, urging their students to tell their parents who to vote for, the incumbents claim. Estrada said only one teacher has been accused of electioneering during the school day, and the investigation has already concluded. Asked about the most recent accusations between the school board and teachers union, Interim Superintendent Pauline Winbush responded in general terms. 44 comments for "Union president accused of placing illegal campaign signs"
Thnka to all voters in Palmdale, and maybe Lancaster, for chosing to elect Carrillo, Smith, and Ricks. Thanks for doing your homework. Look at our last few presidential elections. This is amature hour compared to that. If one party is allowed to post signs. Then the next party is allowed also. Dirty politics is when only one party is allowed to post signs. There are some obvious logical problems with many of your posts. First and foremost, if Ferrin had received complaints from teachers and parents that union members were electioneering on a school campus, he has an obligation to determine if they are true. I doubt he was “stalking” Estrada, and there is nothing questionable about a public official being asked to investigate a possible crime against the public. Even the new superintendent stated that there were ongoing investigations for very serious wrongdoing. Electioneering on a school campus is highly unethical for several reasons. First, children are impressionable, they trust and believe what the adults in their lives tell them. Telling a child about union issues, or a teacher’s choice of candidate is in essence the same as a predator telling the child lies. The child is a captive in a classroom, they can’t leave, they can’t protest what is told them. Secondly, it abuses that teachers promise and solemn responsibility to just educate our children. Their job is not to raise our kids, it’s isn’t their responsibility to tell our children what to believe, and how to think. Teachers should never cross that line. If there were conversations happening about these candidates, then those teacher crossed a sacred line reserved for the family. They have no right to that territory. Also if what has been said in other media outlets is true, the electioneering charges extend out to multiple schools. That make a small isolated problem into a huge issue. If I remember correctly, this same union was, just a few months ago, handing out the home phone numbers and addresses of their board members. I received a copy of that flier from my daughter and the language on it was obviously intended to inflame the public. Here again we have a situation where the union is using unsuspecting members of the public, people who because they don’t have access to other information, must believe what was written on those fliers. And we along with the union, know of course that no parent handed an inflammatory flier in the street is going to take the time to check its truthfulness. The flier can say anything, tell any lie, manipulate any truth. And once again the union has a captive audience. But worse, we live in a time when people commit random acts of violence on one another, even for perceived wrongdoing. By handing out their board member’s home addresses, along with a flier that was inflammatory and truthful or not, this union exposed those same people and their families to some nut committing an act of violence. Finally, by trying to deflect the blame onto someone who appears to have been working in the interest of parents and their children, simply makes no sense. This has from my perspective (mind you I haven’t been in Palmdale long) been a very ugly campaign. But from where I sit it seems that the union, and most of the union posters here are way out of line. The end doesn’t justify the means, not ever. And, you are hurting children, hurting them by what you say and how you behave. Just be good examples for my child, don’t try to raise her for me, I don’t need or want your help. Teach her to be a good citizen by modeling that behavior. Be logical and unemotional, but be passionate about her successes, not your own. And please stop pointing fingers at the people who appear to be innocent. Caught on camera is caught on camera. And a picture is worth a thousand words. I agree with you on many of your points regarding teachers and espousing their political viewpoints to children. It is the parents’ job to answer questions regarding politics, religion, etc., not the teacher’s. I also agree with you that it was in poor taste to hand out fliers with names and home addresses of the board members, especially in today’s society, as you pointed out. I would not want it done to me, so I don’t believe it should be done to others. Regardless of the argument that the board members “are public officials”, it still was poor form. That being said, I do have to say that the board president and superintendent have done some rather unethical things well. On our Back to School Night, district services (i.e. EdConnect) were used to call parents and warn them that they had “heard” that teachers would be picketing off campus and would ruin the night, making traffic difficult to navigate through. The board president used the district website to espouse her point of view in conjunction with the superintendent in regards to her interpretation of the budget and the contract language with teachers. The superintendent used district services at another point in time to discuss our negotiations with parents and the community. The superintendent also indirectly insulted teachers via the Launch Pad, asking teachers to send it home with his “apology” on the last page for “some people’s actions” that he did not agree with. Teachers are not allowed to use anything purchased with public/district money, have political signage or hold talks on campus, yet it seems the superintendent and board president can. This seems to be a double standard, does it not? I also take offense to your likening of a teacher to a “predator telling children lies.” While I understand your point, it was a little below the belt, so to speak, and maybe another analogy would be better suited to support your argument. In as far as not “raising your child”, you have to understand that a teacher walks a very fine line when it comes to educating them; parents and teachers ideally should work together in raising children. While it is certainly not our job to teach them your specific religious/cultural/political beliefs, we are expected, as part of our job, to teach them right from wrong, truth from deceit, responsibility for completing one’s assignments, empathy, logic, and acceptance of responsibility for one’s wrong-doing, as well as how to forgive and be forgiven. In conclusion, you are correct that this has been nothing but an ugly campaign. Both sides and their supporters have been childish and both sides have twisted the facts to sway voters to their side; unfortunately that is the nature of politics. The animosity and lack of trust between the two parties is nearly irreparable. However, I leave you and the rest of the community with this thought: why would a board member, who claims to be in this for the betterment of students’ education, be at a school taking pictures of a political issue rather than in the classroom observing student learning and teacher instruction? You teachers really are having trouble defending this clown, just think about what this guy has done to peoples signs at night when he and his union buddies cannot be seen. Doc you obviously are unaware, or refuse to acknowledge the huge wind storm Palmdale experienced Sunday evening. The incumbents put up numerous signs that weekend using regular staples, not heavy duty and of course the wind will take them away. The educated people used materials that would withstand the elements of the high desert knowing full well we get high winds. Do not blame their stupidity on Mr. Estrada. I believe in karma and I think the incumbents got theirs with the wind storm. Mr. Hugo Estrada’s hand written childish signs are the sign of a desperate man. I can’t tell from the pictures if they were written in crayon or not. I consider his posting of illegal signs on private property no different than teenagers tagging walls. I find it hard to believe professionals on any side would behave this way. I hope that Mr. Estrada is held accountable by the city to clean up his trash signs. These and all election signs throughout the area in opens spaces just add blight to the city. Do you folks really believe a stupid sign on a stick will make me vote for you? Believe me, it will more likely make me vote for your opponent. All of you please pick up your silly signs the day after the election..
Crayons would have been much better. Why didn’t I think of that. Thanks for the suggestion Mr. Ledford. I am hardly the mayor, just a concerned citizen expressing my right to have an opinion. I do find your behavior both childish and reprehensible. The way I see it, you and your supporters think the opposition are all idiots and that YOU know better than everyone else. I could also say the same about your opponents. I certainly hope that our schools teach that diversity of ideas and meaningful dialogue bring results through compromise. It is easy to respect those you agree with but a true leader and righteous person respects those they oppose. The name calling and mud slinging by all sides just show that deep down many adults practice behavior that they would probably ground their children for. While I wish that all so called community leaders could lead their lives as examples to the children, I know that that is far from reality. Maybe though we can get the city to ban all these ridiculous signs. How many will you collect after the election? Your board LOSES $20,000,000 and your pick sends letters requesting cash and support from personal, and you’re outraged by this? Sad! Mr. Hugo’s picks have made some very real and bad career moves, and this is all you choose to attack him with! You deserve to lose the vote, just for being to lazy to do your homework. You need to go too, soon to be EX Mayor! Please look at my post on letters-to-the-editor and letter uncensored on FB. You will see a true violation of campaigning rules. Mrs. Corrales illegally solicited campaign contributions from the senior administrators of the district. Many were afraid that if they did not contribute, there would be retaliation. I posted both the letter she sent out soliciting contributions and then her letter apologizing for the “mistake.” I filed a complaint against her back in September for that action and the district stated that she is not an officer of the district and therefore the rules don’t apply to her. However, in her apology letter she clearly states she is an officer and that what she did was wrong. I also filed a complaint against Mr. Ferrin for using the district paid portrait on his campaigning materials. District stated that his image is not copyrighted. I also filed a complaint against Mr. Ferrin for threatening me and challenging me to a fight in front of parents. I have yet to hear about that complaint. This is nothing more than retaliation. I will post her letter and apology on avpeta.org as well asap. If what you say is true about any complaints you have filed, then you just violated California employment law by divulging the nature of the complaint. The law is very clear. But I suppose laws aren’t important to you. I know your reputation, and I remember the front page news articles detailing your arrest for threatening a peace officer, a local medal of valor, we’ll respected deputy sheriff. I seem to remember in the articles that you were accused of allegedly pointing your finger at the deputy, simulating a gun, and telling him that if you had been a gang member he’d be dead. All over a simple traffic stop. Also, in this day and age, isn’t all that difficult to take a peek at your past transgressions of which there appear to be many. Where there is smoke there is fire. You sir are not a man of honor or integrity, and you certainly have in the recent past been accused of some very real crimes. I’m amazed that you can even garner any support. Perhaps you should just be quiet now before the ethical people reading your posts and about your nonsense decide to look into your past. And please stop acting like such a child. I have heard that you allegedly file complaints over fabrications, and that not one has ever been proven accurate. You’re like that kid in a classroom with a propensity to cause trouble and then point your crooked finger at everyone else for blame. Shame on you. Two words foe you Dan. “Not guilty.” Now stop making me an issue and vote the incumbents out! Hugo, “not guilty” is not the same thing as “innocent.” They are “very” different from one another. Even the dummies that watch TV crime dramas, know that. One of the cornerstones of this great country, the judicial branch of government. These random articles are just the tip of the iceberg when it come to the corruption and negative campaigningthat Mrs. Coralles-Enix says is ” These types of desperate tactics, mean-spirited tactics are indicative of the type of campaign that they run,” Corrales-Eneix said Thursday.”. Look on Facebook vote out psdboad and everyone can find the “smear campaign” the desperate Coralles has been running. Coralles never answered any questions about the budget when it was found that she and the incumbents had used falsified financial books when negotiating with employees and coating parents money claiming to be broke when the district had a huge surplus. She and the incumbents had Pauline Winbush call Jeffrey Moffat and tell him he would be arrested if he came on PSD grounds (which they can’t do) because he reminded everyone that the board OKed the buying of expired food for a cheaper price and tried to say “it was not a problem”. Did you hear about any of this in the AV Press? No, because the AV Press does what Jim Medford tells them to. The corruption with this group is the problem, voting them out is the cure. Why is this article newsworthy? Have any laws been broken? Were any techer violations confirmed? Or is this just about Jeff and Sandy whining? Again, has any of these accusations (becaue they don’t even rise to the level of allegations) been confirmed? If not, why is this stoy newsworthy? Seems to me like the accusations/allegations have been not only confirmed but they are true. 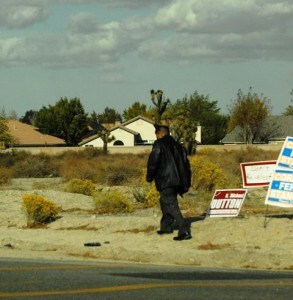 Here’s why: Photos show Hugo placing signs in the vacant lot as he calls it. It may be vacant but don’t get in twisted, the property belongs to someone. He admits that he did not ask permission to place the sign. The rules state that “campaign or political signs cannot be placed on private property or attached or otherwise affixed to privately owned signs without the permission of the owner of the sign, and/or the owner of the property.” Therefore Hugo’s sign is illegal. Also his sign treads the line of vandalism because it defaces the meaning of the incumbents’ signs. I’m sure they did not want their message to read Do not re-elect Corales, Ferin and Sanford. Petty as it may seem, the incumbents have a point. As pathetic as this whole situation is, Hugo is guilty (at least according to the article) and should face repercussions for placing the signs around town. Okay I just wasted two minutes of my life that I will never get back. Good grief! You people pay union dues for this clown? No wonder your candidates had to go to Lancaster to get their money. It will not work!!! The more shiny, expensively printed attack flyers that I get in my mail from these Lancaster-based clowns, the more I’m convinced they are nothing more than an attempt to bamboozle the voting public into making a bad decision in the polls next week. I ain’t falling for it! Unions should go to hell, they destroying this country! I think you’re not understanding the use of union in regards to workplace unions. The US is not a union in the same sense of the word. The NRA is an association, not a union either. The previous poster was commenting specifically on workplace unions. Which to many have become overly powerful. I’m sure the NRA would stand up for gunsmith work rights and ensure they make a decent wage and health benefits. Job well done Hugo! Mr. Estrada just might get reelected to One more term. I question the desperate actions of incumbents. This election seems to be over and incumbents know it. Looking for excuses as to why they will loose the election? This is a good One. The public right of way road dedication I believe is fifty feet from center of road at that location so that would make ALL them Signs ILLEGAL!!!! No one should be voting for an incumbent in any race, need freash start and new blood! Rember incumbents on this board sat back and allowed the purchase of 60 acres for future college campus for $5 million cash on the San Andres Fault Line at 25th St East & Barrel Springs Road ( look it up) talk about caring for students higher education! And local tax dollars! They continue to build new schools without sidewalks and bike lanes for students. They let a $450 sewer bill go on your annual property tax bill ever year (look at it) and you want to elect incumbents who run in packs and endorsements of packs. Be smart citizens ur future and ur kids, grandkids and community is counting on you! Time for new blood vote incumbents out! This is just flat-out pathetic. I am a teacher at Los Amigos and I saw a similar sign next to the incumbents’ signs Monday morning near 67th but I do not recall seeing one placed where this picture was taken. I had no idea who had placed it there and it was gone by the next morning. I am offended by the accusations made by the board members, as would be all of my colleagues. Just because you don’t like what someone has to say doesn’t make it “illegal”. I am nearing a decade of work in the Palmdale School District and have NEVER seen this kind of behavior. What a sad state affairs when board members up for re-election sit outside a school in order to find a possible problem with campaigning rather than entering the classroom to observe the students’ learning environments. I concur with Mr. Estrada’s statement regarding missing signs for the teachers’ choices. I have observed the disappearance of two separate signs while nothing has happened to the incumbents’ posters. Yet none of us have the time to stop and take pictures because we are working, so we just roll our eyes and carry on. This whole thing is absolutely ridiculous and embarrassing and is doing nothing but giving our schools a black eye. Enough is enough! If this dude wanted to stand there and hold his sign like he owned it, I would respect his ‘freedom of speech’ argument. What he did however is more like graffiti than anything else. And NONE of these signs should be junking up private properties without the owner’s consent. Also just heard the Palmdale School District threatened to arrest Jeffery Moffatt. This current crop of incumbents is really running scared. Well they brought it upon themselves with their lack of respect for employees and blind allegiance to the supt. AVPress front page news!!! So ridiculous! Ferrin has just confirmed he is an [removed]and if the interim sup has nothing better to do then investigate Ferrins [removed] pics then she should go as well! Estrada placing that hand written sign is no different then the hundreds of garage sale signs that go up all over this town every weekend. Frigin grow up Ferrin you chump! Garage sale signs are illegal. It is pathetic…but also very entertaining. Someone needs to turn it into a movie… a comedy, of course. I enjoyed when Stanford said that a lot of administrators would quit their job and work elsewhere if she’s not re-elected. It’s funny but an oddly pathetic thing to say. Are we to believe that Mr. Ferrin just happened to be in the area because he heard teachers at the site were electioneering? Sounds fishy. If it is true, then why is he waiting in the parking lot to take these pictures, instead of being in the school site? Mr. Estrada might be guilty of doing a petty act, but it certainly is not something to remove him from his current position. If you have enough time to watch for someone putting up “Don’t Re-Elect” signs, you probably aren’t spending enough time working at your job. I mean, this article is far more telling about Ferrin than a handwritten sign by Estrada. I could understand if someone was destroying your property (signs,) but a sign adjacent? Come on.